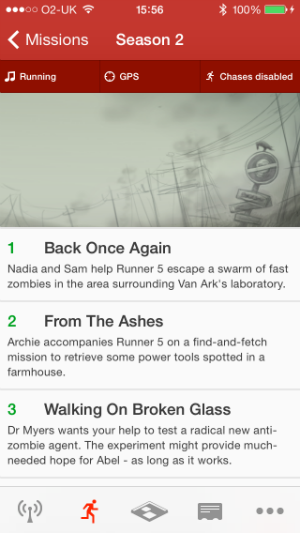 A round-up of our many game modes – Zombies, Run! Zombies, Run! has changed a lot since its humble beginnings two years ago. We’ve added many more game modes and features and, with the impending launch of Zombies, Run! Season 3, this seems like the perfect time to take a look at what’s currently available in the game. We’ve got long runs and short runs, light hearted frolics and epic odysseys. There’s something for every runner and every gamer! Where it all began: this 23-mission season throws you straight into the world after the zombie outbreak, and introduces you to the characters and stories of one of the last outposts of humanity: Abel Township. Set during Season One, these seven supply missions are replayable, randomised runs during which the residents of Abel will request specific items for you to find. Great for when you don’t fancy listening to a whole mission, but still need to gather supplies to develop your township! These special race missions are set during the latter part of Season One and differ from normal missions by requiring you to run a set distance. Six races exist in all: two 5ks, two 10ks and two 20ks. During these missions, the story progresses each time you hit a new distance milestone (rather than at the end of your songs). These are a must-play for Zombies, Run! completionists out there! Zombies, Run! Season Two includes a whopping 40 main missions, with 23 side missions. That’s 63 new runs, during which you investigate the mysterious Van Ark and find out how he was involved in the initial zombie outbreak. Fancy a more light hearted run? Jack and Eugene’s Radio Abel will keep you entertained without having to worry about pesky zombies or saving the world. Another special type of mission, Airdrop allows you to set your own airdrop waypoint using real world maps. Run to-and-from the waypoint and you’ll be fed a specially made mission, just for you. Previous Post Stats! Stats everywhere!